Terri Hooley in his wrecked shop in North Street Arcade, days after the 2004 fire. Pic by Michael Callaghan. It may be a decade since one of Belfast’s landmark buildings burned to the ground – but for some the pain is still raw. North Street Arcade, a 1930s mall filled with small shops on the northern edge of the city centre, was engulfed by a huge blaze exactly 10 years ago today. The fire has always been held by many to be the result of arson. But despite a police probe to this day no-one has ever been charged in connection with it. It has also never been redeveloped, and it remains a shuttered shadow of its former self whilst much of the Cathedral Quarter which surrounds it has evolved into a hive of pubs and restaurants. Among those who lost out dramatically was record shop owner Terri Hooley. The 65-year-old east Belfast man said: “We were one of the 23 businesses that were burnt out – arts businesses and community groups. “We had been there about a year-and-a-half, and we had the largest collection of vinyl in Ireland at the time. He was at a gig in the Empire when he got a phone call to say the arcade was aflame. However he stayed to introduce the next act before rushing to the scene, where he found the fire brigade battling to contain the conflagration. When he eventually got in to assess the damage, he was confronted with complete devastation. To make matters worse, his insurance had lapsed three weeks earlier. For example, among the countless records in his collection were three copies of a single by obscure Northern Irish act The Peasants – which he said now retail at £500 each. Among the businesses which were affected were a pet shop, hairdresser, cafes, and the headquarters of the Cathedral Quarter Arts Festival. It did not take long for suspicions to form about its cause (see below), and Mr Hooley said that almost everyone seemed to have a theory of their own. He was trading as Cathedral Records at the time of the incident, and is still operating from a shop nearby in North Street called Good Vibrations (the eleventh incarnation of his business, which has constantly closed and re-opened over the decades). However he has never truly got over it. “I can’t believe it’s 10 years now,” he said, adding that they had planned some kind of commemoration to mark the anniversary, but were instead going to mark it in a more cheerful fashion with a party at his shop on Saturday. One of those who also ventured inside to survey the aftermath was photographer Michael Callaghan, 54, and from south Belfast. “At times I’d be down at the John Hewitt (opposite), and look across at the place and it breaks my heart – it really does break my heart,” he said, adding that if the fire had not happened, today the arcade would be a “lively, vibrant place”. The blaze happened on a Saturday in 2004, and the first report of it in the News Letter recorded that it had taken around 100 firefighters to extinguish the flames. Adjoining buildings were evacuated as firefighters tried to prevent it spreading, and one fire officer believed it had been burning for some time before the alarm was raised. 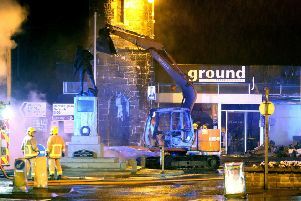 By Tuesday, the News Letter carried the following headline: “Fire at historic arcade suspicious, say police”, though it added forensic teams were still working to establish the cause of the blaze. Today, the PSNI’s position is that the case remains an open arson investigation. It added that although a number of people have been interviewed, to date no one has been charged in connection with the incident. Built in 1936 on the site of a former linen warehouse, the building was granted Grade B1 listed building status in May 1990. Despite the damage from the 2004 fire, the Ulster Architectural Heritage Society (UAHS) said a year later that it was “restorable”, although it was included in the list of the Province’s “at risk” buildings. It currently sits in the middle of an area which has been earmarked for a development called Royal Exchange. Permission granted in 2012 for the huge retail-and-office scheme in the Donegall Street and North Street areas remains in place until 2017. The massive application includes a hotel, two retail pavilions, 205 apartments, a cultural/arts centre, the creation of new streets and the reconfiguration of Writer’s Square – and the partial demolition of the arcade.